I have a small wardrobe. Made up of quality pieces I love, plus a few cheaper items which go so well with the quality pieces that I couldn’t resist them. I regularly edit out what I know I’ll not wear anymore, clothes that no longer fit my body or my lifestyle. Only those items which can make me sigh and say, “Yep, I’ve still got it.” get to live in my closet. I am seriously strict about that. Mostly because, at my age, I can’t afford to be soft on clothes that don’t make me feel good. One item in my closet that always makes me feel good is this pair of leather pants. I bought them back in the fall of 2013, and ever since I’ve been doing a leather pants redux, over and over, year after year. Like the top, love the pants and boots, still musing if I want to wear them all together. I bought my pants at Holt Renfrew, Canada’s version of Barney’s or Harvey Nichols. I used to love to shop at Holts, especially since, besides the expensive designer stuff, they sold a great selection of quality pieces under their own label. Well-made pieces that didn’t break the bank, like my leather pants. To be perfectly “transparent” these pants are not real leather; the label says “made in Canada from quality Italian vegan leather.” I think that’s what we used to call “pleather” back in the day. But my pants feel and look like the real thing. They have a soft lining, and are neither too stretchy, nor too shiny. They have pockets in the back and front and look like real pants with a fly, but they just pull on. They have a straight leg, and a slightly moto vibe with a seam across the legs under the knee. And… they are NOT leggings. Perish the thought. I like leggings, just not in leather. 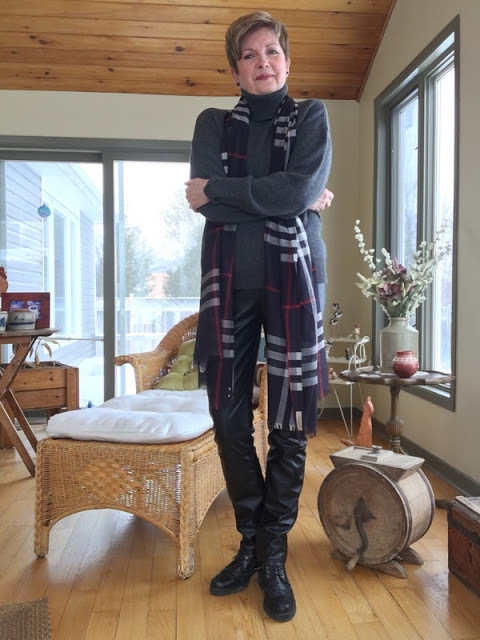 2019 leather pants redux, with a Theory cashmere sweater and a Burberry scarf. So, I’ve hauled these pants out of storage every fall since 2013, tried them on, and decided that since they still make me feel good, I’ll keep them another year. I don’t know how you define clothes that make you feel good, but for me that means the tops and jackets and pants which cover up (or skim over) the lumps and bumps that have appeared over the years despite the fact that I eat a healthy diet and exercise religiously. At the same time they flatter my frame, don’t add too much bulk to my upper half since I’m top heavy enough as it is, yet don’t hide those bits with which I’m quite happy. All that plus the fact that they can make me sigh and say, “Yep. I’ve still got it.” Whatever ‘it’ may be. Ha. Look du jour. Theory cashmere turtleneck, Michael Kors scarf, and Uniqlo jacket. When it comes to pants, or trousers, and jeans, I like a slim leg and a high waist. I love a nice cropped pant for spring, summer, and fall. For winter I like full-length, skinny or straight-leg pants since they look so good with boots. Even though they’re a wardrobe basic, black straight-leg pants can be a bit… well… boring. 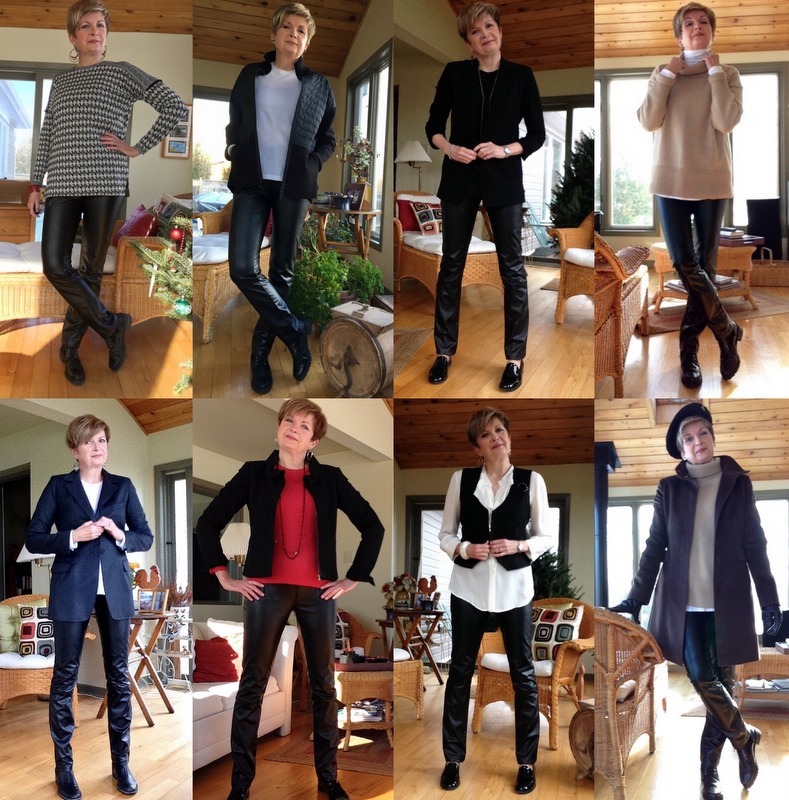 On the other hand, black leather straight-leg pants, my friends, are not boring at all. Plus I love how they go with almost everything I own. I’ve worn these pants with my blue Smythe blazer back in 2013, and my black quilted Lafayette jacket and a loose Vince tee last year, with cashmere turtlenecks, ruffled silk blouses, and vintage berets. Leather pants looks over the years. This year, I’m liking my leather pants with my charcoal Theory turtleneck, either my plaid Burberry scarf or a Michael Kors grey and black animal-print scarf, and my, now ubiquitous, off-white down jacket from Uniqlo. I know I could try to up my fashion game and wear my leather pants with sky-high heels. (In a Canadian winter? Really?) Or with my bulky sweater tucked in. (Ha. Not in this life, people!) I guess I could try them with more “directional” jackets. I read that word all the time in fashion mags and according to this source it means a weird new style that may possibly be the direction fashion will take sooner or later. (I’ll pass on that, thanks.) I may decide to hem my pants since they seem to be pooling a bit over my boots, but other than that extra inch of length, I’m happy with them as they are. And I’m happy to wear them with turtleneck sweaters (untucked), long-sleeved tees, or silk blouses and blazers, and low-heeled loafers or chunky ankle boots, conservative though these looks may be. This look is so me. Casual, comfortable, with a bit of edge. I guess what I’m trying to say is that I don’t need to go all kooky or wear outfits in which I am decidedly uncomfortable in order to feel current. I think there are certain pieces, like my leather pants, that have style longevity. And as long as they still fit, and make me feel good, I’ll keep on restyling them again and again, year after year. That is until I look in the mirror one day and gasp: “Uh oh. Not feeling ‘it’ anymore.” Whatever ‘it’ is. Then those pants are gone quicker that you can say “consignment store.” I am vicious with clothes that make me feel bad… puffy, or frumpy, or past my sell-by date. At my age I can’t afford to fool around with wardrobe pieces that don’t do me any favours. 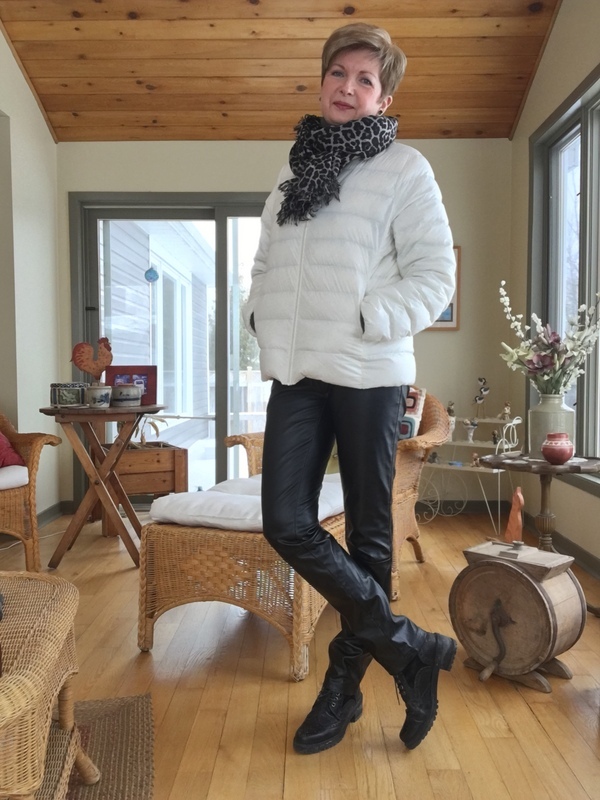 Still feeling fierce in my leather pants … for now. For the sake of interest, I’ve searched off and on all day for leather and faux leather pants on-line, pants which I like and think I’d wear. And it seems quality, not too shiny, nor too stretchy leather pants which are NOT leggings are not easy to find. Which is strange, when I think about it, because MatchesFashion.com says they are once again one of the top ten wardrobe essentials of the season. Of course if you want to pay a premium price they have some lovely leather trousers on the Matches Fashion website. You can find them here. And Stella McCartney has a great-looking pair of cropped, faux leather trousers on the Harvey Nichols site which you can find here. Nordstrom has genuine leather trousers and leggings here, as well as faux leather pants. But my goodness, sometimes I can’t believe how poorly Nordstrom merchandises the clothing on their site. I’d not buy anything from them on-line if I didn’t already know the style and fit. All of which makes me grateful that I bought my leather pants way back in 2013. They have done yeoman service all these years. And I still love them. With a yearly redux, they can still make me feel current, and a little bit edgy. One might even say fierce… at least for now. P.S. The comment “I’ve still got it,” is an inside joke that started one year when Hubby and I were on a ski trip and, in the bar after dinner, I encountered a very inebriated young man who seemed to take a shine to me. You can read that story here. Now, let’s hear from you my friends. Do you have pieces in your closet that work for you year after year? You certainly rock those trousers, look really good. I will take away from this post the thought to try my clothes on and decide if I have got it. If not to offload and that is something I really need to do!!!! Thanks, Jeanette. I think off-loading stuff that doesn't make you feel good is freeing. Mostly because when items sit in my closet unworn, I feel guilty for not wearing them. I love those pants, on you and in general. I cant begin to tell you how many faux leather pants I have ordered and returned trying to find what you have. The quality fake leather, not leggings, interestingly detailed, straight leg pants. It is my holy grail. I have not seen any that are not clingy and kind of tacky… unless they are really expensive. 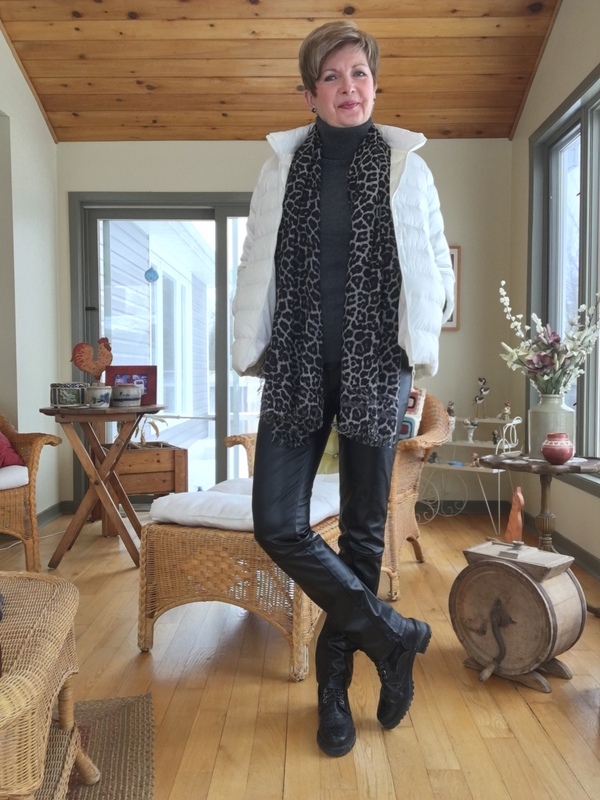 Love the leather pants of you – faux or not. I have a black leather jacket that I bought 35 years ago and always makes the wardrobe cull. I still get loads of compliments on it and it's gotten better and better with age. I've had leather pants but basically too hot for Los Angeles. That are warm, so I never wear them until fall. They are great in the winter. I always wonder when I see people in leather pants and sandals and light tops. Aren't they too hot? Having read this I went upstairs and took out a load of clothes that had been in a holding pattern for some months, put them into bags and dumped them in the Salvation Army recycling tank. I am not sure if I was kidding myself that I would ever wear them again but their time had come. There isn't really anything in my wardrobe that has stayed forever, although I may continue a theme: black trousers, white shirts, loafers when they wear out. The only thing I can think of is my vintage suede car coat which is brought out in the Spring but it must be over 50 years old now and I am not sure how many more Springs it will see. I have owned it for 20+ years now. I think my new nickname may be Thrifty. Thrifty Green. A bit like Slim Keith. Cool. Good for you, Thrifty. That made me laugh out loud! I always see vintage suede coats at the Vintage Show here in Ottawa… and drool. But they never ever fit me. Always a size small, with narrow shoulders. On some of the websites which sell leather and faux leather pants, the pants were so tight, with tops tucked in, that even on very skinny young things they looked terrible. I have black pants too. But they do need a punch of something. Beautiful black wool trousers are a different matter. Fabric is everything isn't it? In old Zagreb's colloquial language we have word "pardon"-it means something like "pardonnez-moi" in french,one can use it as real "forgive me" ,"sorry" or ironically. When I use it in cases similar to Mary's,I usually get (if I get an answer at all) the sincere "You're welcome" or "It's nothing" (and they were standing on my feet f.e.)! We say "pardon me" as well. Especially down east where I grew up. P.S. I think we must have similar wardrobes Dottoressa. Except for your beautiful silk summer dresses. Thanks, DA. Clothing conundrums are certainly exacerbated by weight fluctuations. I have a layered silk tank that is narrow on the sides but full in the front. Boy… it hides a multitude of sins. Not that getting "thicker" is a sin… Ha. Hope not anyway. Thanks, Dianne. My pants do not get stiff in the cold. They are really supple. Which is one of the reasons I love them and probably accounts for the fact that while faux leather… they were not cheap. Love those, also, the boots/shoes totally make the outfit IMO:). A few other great buys I found there include a Burberry trench and an aqua tweed St. John (Chanel-looking) jacket. Also found there some Escada black jeans that I would wear for the next 20 years if they could last that long. But I think my favorite two pieces of clothing are my Levi 501s and an ancient Brooks Brothers white button-down shirt that just gets more comfy every time I wash it. I could wear those two pieces twice a week. And I often do. In fact, I'll be wearing the 501s today. Wish we had a really quality consignment shop like that here. Boy… there were some wonderful ones in Bath in the UK when I was there. I had to chuck the last pair of Levis I owned… they really did wear out. I became afraid to bend over too quickly. Distressed is one thing… undressed another. Ha. Those pants look amazing on you!!! Perfect with your long legs and slim frame!! Thanks, Debbie. We must make the most of our assets, I think. Ha.